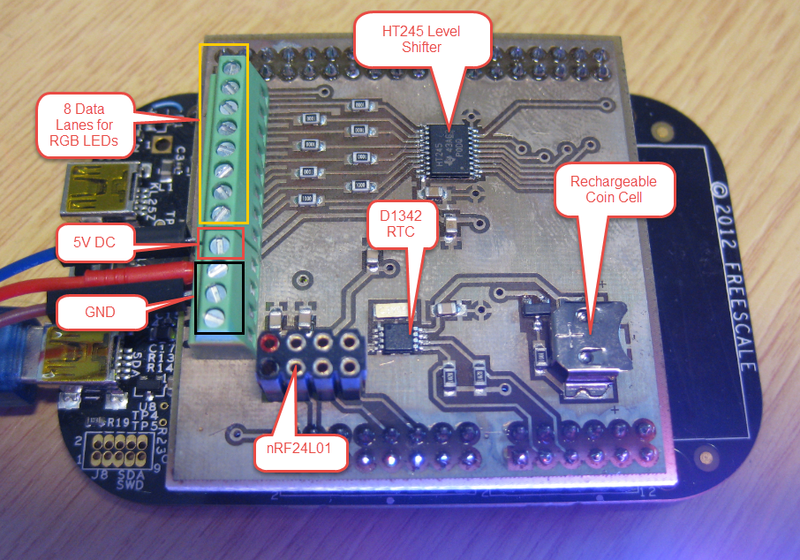 The shield uses a high-speed HT245/74HCT245 levels shifter to transform the 3.3V signals from the FRDM board to the 5V required by the WS2812 LEDs. 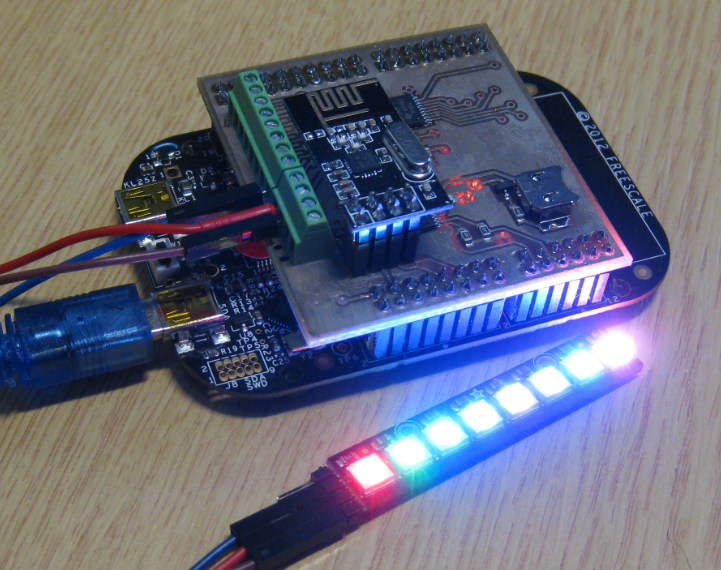 The shield features a DS1342 realtime clock which is now supported by the RTC_Maxim Realtime Clock component too. The coin cell is recharged if the board is powered. The nRF24L01+ module has been added to the shield so I can control it remotely. The board features a 5V DC supply (directly from the FRDM 5V header) to allow to run a small amount of LEDs (keep in mind that each LED takes up to 30 mA!). Using less than 10 LEDs no external power supply is needed. The board has 8 data lines using the pins PTC0 to PTC7 of the KL25Z microcontroller. With this, each RBG LED only requires three bytes of RAM, so with a single FRDM-KL25Z board which has 16 KByte of RAM I can control more than 5000 LEDs! In my earlier project (“First Adafruit NeoPixel Blinks with the FRDM Board“) I already used DMA with PWM to control the pixels, but only on one channel. And for each data bit I needed 16bits of RAM. This works up to a small amount of LED’s (<200), but then I will run out of RAM easily. A different approach was needed to save RAM. The idea is to use an 8bit data port and use it to ‘bang’ the pixels out. The approach is nothing new (e.g. the Teensy is doing the same thing). 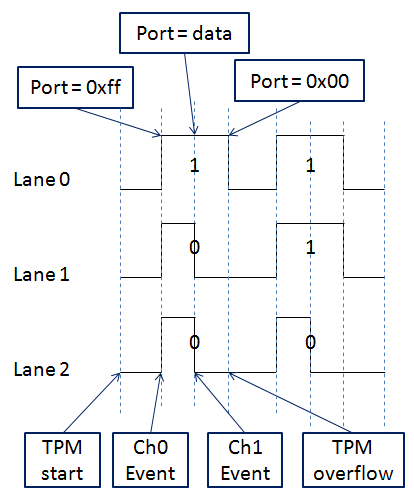 When channel 0 matches (CH0 Event), it triggers a DMA event which writes 0xff to the port to pull up all data lines. When channel 1 matches (CH1 Event), it triggers a DMA event which writes the data (8bit) to the port. With this the data bits (RGB values) are shifted to the lanes. When the timer overflows, it writes 0x00 to the port to pull down all data lines. /* the 'set all bits' and 'clear all bits' DMA events will use a single value, so no address increment. The more challenging part was then getting DMA to run properly on the KL25Z. While things worked well at a slower speed (say 3 us timer overflow time), it terribly failed when I reduced the timing down to 1.25 us: bit were not transmitted, DMA looses (????) events, DMA event triggered even if all flags are cleared and Timer DMA events disabled, with even the timer clock timer disabled. All kind of weird things :-(. In other cases it was loosing bits, and simply screwing up everything. Again, the problem only occurred when I was getting close to the 1.25 us timing period. Reading the Freescale data sheets back and forward was no help, and I had not found and solutions in the usual forums. I was about to pull out my last hears, when I realized that when I disable the timer, it still runs internally for a while! For example if I reset the timer to zero and stop it, it still counts up to 0xE or even 0x15. So this definitely will cause an (internal) channel 0 event, even if events/DMA are disabled! 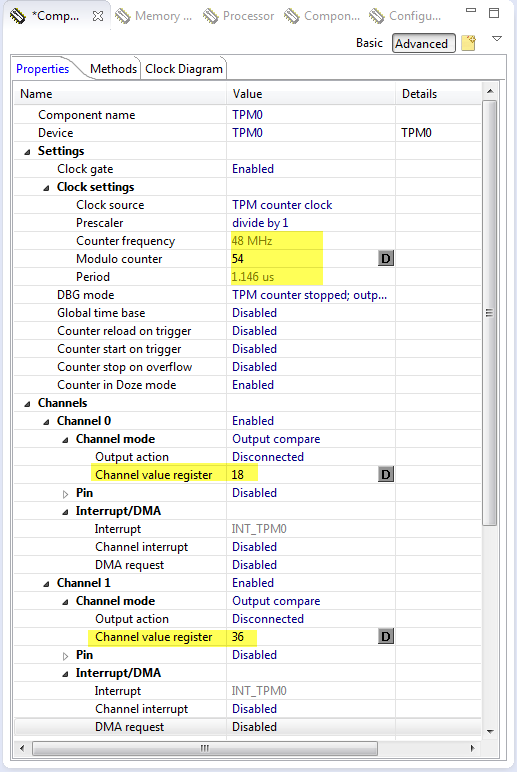 Because of the device internal propagation delays, I cannot cleanly stop the timer before it hits the first DMA (internal) event, which then is latched and will cause a ‘ghost’ DMA event :-(. Always clear the DMA done flags. Write zero to the timer counter register, followed by clearing the timer event flags. 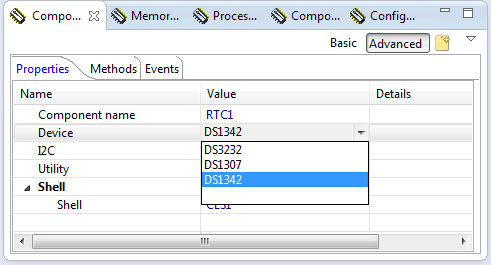 Have the Timer DMA bits only enabled during the actual transfer of the bits (although the auto-complete-and-disable feature of the DMA should take care of this, but if fails because of internal propagation delays of the KL25Z). The only way to get rid of the internal DMA status bits and to get it forced back to a clean state, is to disable the DMA muxing and enable the muxing again: this seems to reset the internal state machine. 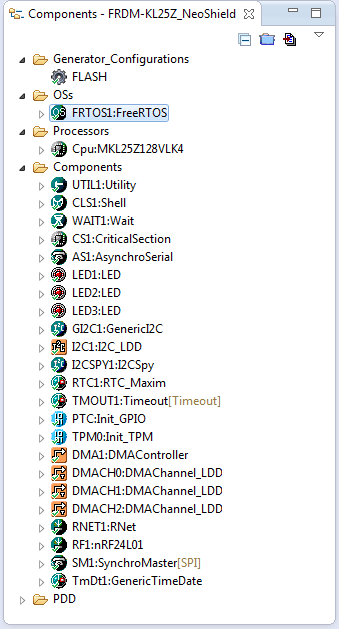 /* disable DMA-Muxing: necessary, otherwise DMA events on TPM0 channel 0 might be still latched. A data sheet or reference manual does not tell you every (important!) detail of the chip. Probably because the designers of the chip do not write that documentation, but someone else who does not have that insight. Peripherals like timers have sometimes some weird behaviour, as they have internal delays, latches and all kind of things which can cause troubles. Viewing at the bits with the debugger does not tell every internal meta-state of the hardware. In my case the timer was still running on for a while in the hardware, even if I have stopped it from the firmware. That skew of the timer caused internal DMA triggers (even if DMA disabled?) and therefore screwed up everything. In my case, turning off muxing and turning it on again enforced a clean reset of the DMA engine, and finally the bits were DMA’ed out as expected. The sources of this project are available on GitHub here. The schematics (Altuim) can be found on GithHub here. This entry was posted in ARM, Boards, CPU's, Embedded, Embedded Components, Freescale, Kinetis, KL25Z Freedom Board, Processor Expert, RNet and tagged Debugging, freedom board, FreeRTOS, Freescale, Interrupts, KL25Z Freedom Board, open source projects, Processor Expert, software, software project, technology by Erich Styger. Bookmark the permalink. I was once trying to implement a very simple bare metal code for TWR-k60n512 kits UART5 device, I could not set the port MUX bits for Tx and Rx pins. I figured out through trial and error that if I first clear the port MUX bits to 0x0 then setting them later works. A lot of things like this happens in hardware that is not described in documentation. Talking for overhead, for cheap hobbyists (like me) Ada-Fruit renames&re-sells those Chinese matrices too expensive, so i recommend to search for “WS2811” on Ebay for strips and search for “led matrix” to get to the square matrices. Also Altium is one of the most expensive and RAM hungry PCB software I know, we (hobbyists, students) tend to use EAGLE. No, the DMA_PDD macros do not add overhead, or very small. I still can writeit directly like you suggest, it is just a matter of style and amount of time to invest as a programmer. About Adafruit: they have great product, publish outstanding tutorials and their hardware is of very good quality. I know that I can get somilar stuff from China, but I willing to honor the work Adafruit does and the value it they provide to me, beside of the pure hardware costs. Additionally, I had several bad experiences with cheap WS2811 (Ebay, China, …) suppliers too. I think as with everything in life, we get what we pay for. I agree on your comment about Altium vs. Eagle, and this is as well the reason why I personally prefer Eagle. I did import your latest PE components and so I am at loss to understand what has changed. I just tried that project, and it builds fine for me? Maybe you can send me your project zipped to the email address listed on https://mcuoneclipse.com/about/ and I have a look what is missing. got the files, thank you! I’ll respond to you directly.